Players: Eli Manning, Odell Beckham Jr.
EAST RUTHERFORD, N.J. (AP) The New York Giants have their heir apparent to Eli Manning, just not the one everyone expected. 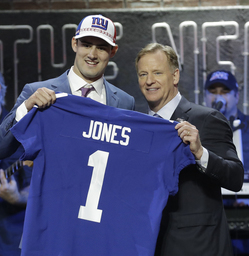 With glaring needs for an edge rusher and defensive players, the Giants stunned many at the NFL draft by taking Daniel Jones of Duke with the sixth pick overall. 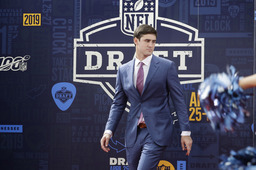 In the weeks leading up to the draft, many prognosticators felt the Giants would fill the defensive needs with the pick and maybe turn their attention to quarterback at No. 17, the pick they got from Cleveland by trading wide receiver Odell Beckham Jr., perhaps targeting Dwayne Haskins of Ohio State or Drew Lock of Missouri. 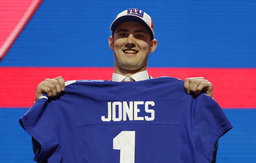 General manager Dave Gettleman had other thoughts and took Jones, who threw for 8,201 yards and 52 touchdowns in three years starting for Duke. He also ran for 1,323 yards and 17 TDs. Finding a replacement for Manning has been a pressing issue for the Giants. The two-time Super Bowl MVP just turned 38 and is entering the final year of his $84 million contract. While Manning's statistics aren't horrible, the Giants have won eight games in the past two years (5-11 in 2018) and they have made the playoffs once since winning the Super Bowl in February 2012. Manning's biggest flaw is his mobility. He is a solid pocket passer but lacks the ability to extend plays in coach Pat Shurmur's offense. The offensive line allowed 47 sacks last season. 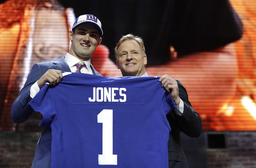 The 6-foot-5, 220-pound Jones is similar to Manning. He is a three-time ACC selection and was impressive in the Senior Bowl, winning MVP.